Home WaypointsFelix Last Day on Land! 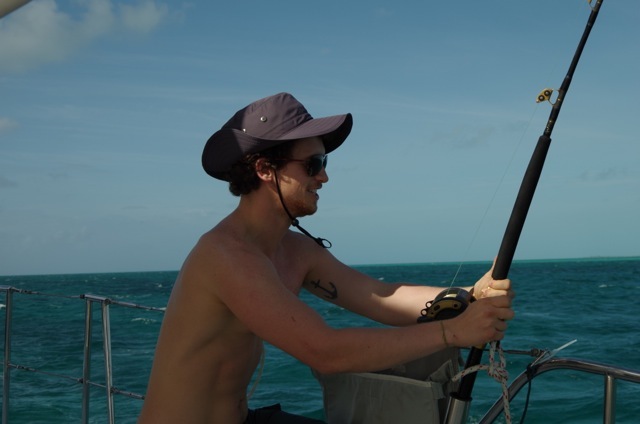 Yesterday we decided to spend the day at our anchorage and wait for better weather. With up to 30 knots wind, we are well shaken up, although we have anchored pretty close to the island. The guys got a thousand things fixed, we got our water tank full, and everything is ready. This morning the captain hammered at the door, and we jumped off the bed. Did something happen? No, just time to get up :). We left a mildly rough Tarpum Bay after around 1.5 days for about 3 hours ’til Davis Harbour. The weather was still rather stormy, so we decided to spend one night in Davis Harbour, a little closer to our goal, and sheltered from the weather. The sail was pretty relaxed because we had some tailwind and did not have to fight against the waves all day. With a little time and a calm sea we start to throw out fishing lines and hope for a nice catch to complete our dinner. 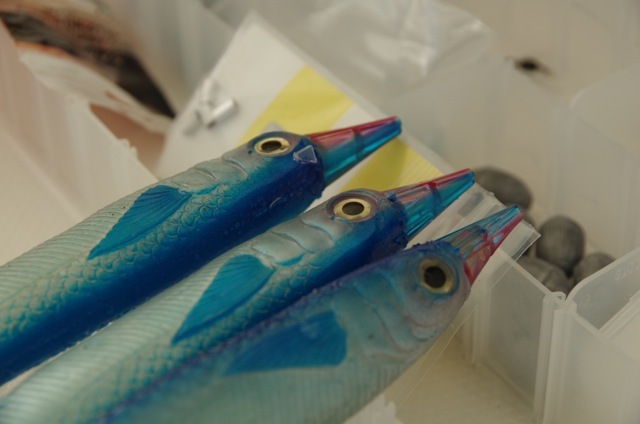 For a while nothing happened, and exactly as I tell Marco just that his baits catch nothing – BUM. The line runs down, a fish has taken the bait! The fish struggles panickly in the water. As it happens, we find all the distant splashing rather weird… because it turned out it was coming from two lines! A second fish! We get the impression that one must be huge! Marco tries to get the big one in, and I grab the fishing rod. The Captn helps out so I can shoot some photos. So far, we can only imagine how big the second fish must be. 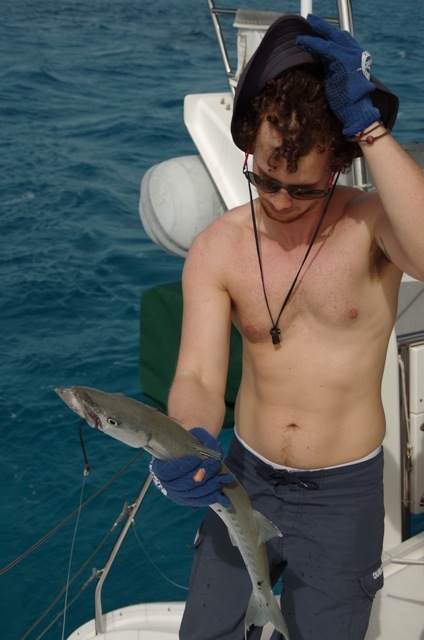 With a lot of strength Marco gets the fish onto the boat and it becomes clear, it’s a fat-catch. On each side, a Barracuda! Unfortunately one cannot eat Barracudas beginning at a certain size, due to the danger of Ciguatera poisoning. 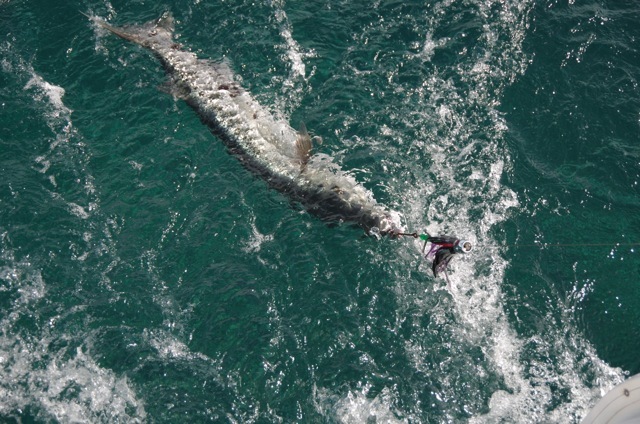 So we let the big one go (after some fighting to get the hook off). 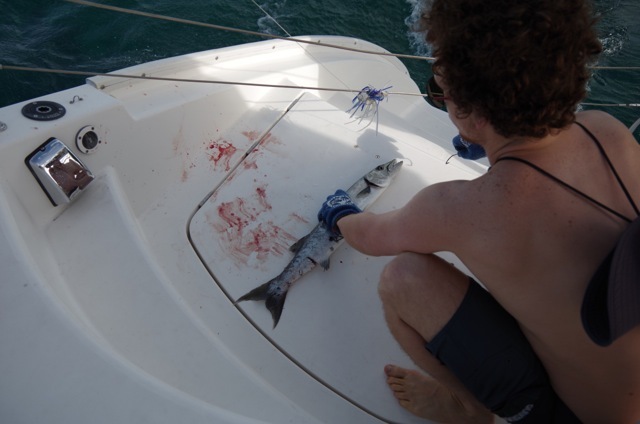 After that, we brought the small one onto the boat, and found how aggressive barracudas really can be. We also let that one go (to become food for someone else), and were left without food ourselves. The time came, as we neared the marina, to reel in the baits. Oh well, no fish today… BOOM. The line goes again. 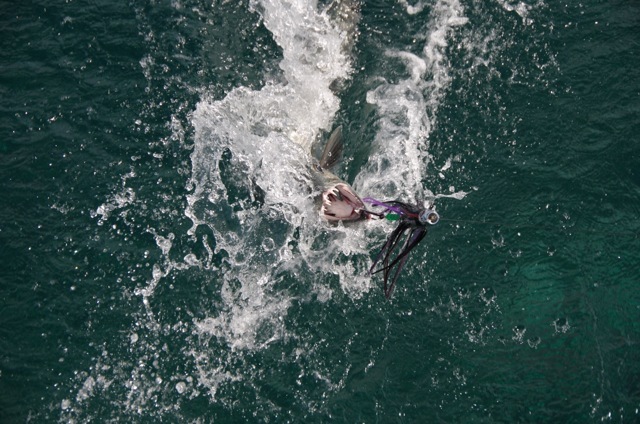 Another Barracuda, small enough to be enjoyed as a meal, big enough to serve as dinner for three. 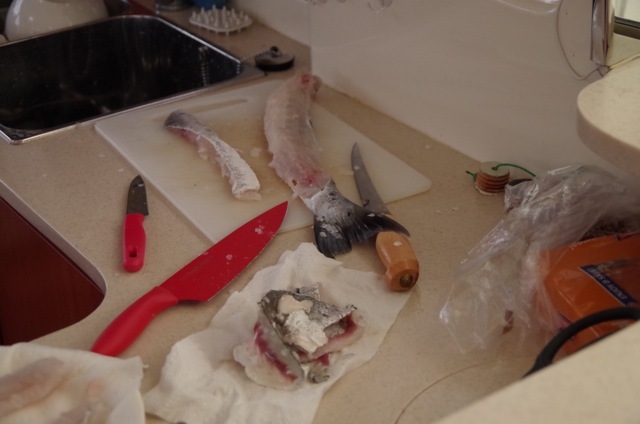 Head off, guts off, and Marco quickly handed me the fish, which I tried to make some filets with. 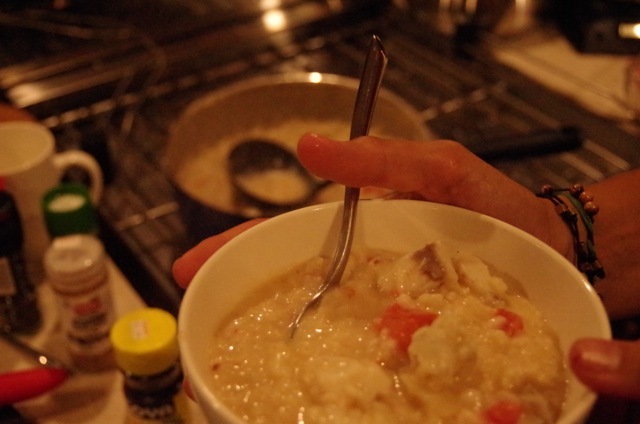 After a bit of work, I had some good pieces and we decided to make a thai risotto. We didn’t have many ingredients, but we could work something out. We docked, and the boys went quickly to the marina office. After 10 minutes I hear Marco: Gesa! Come here. We brought a friend. 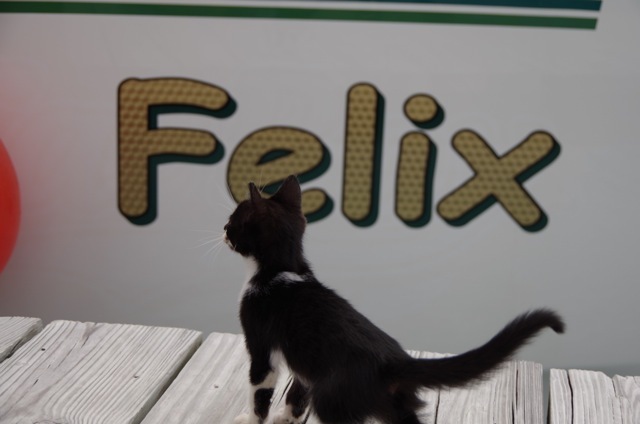 I looked curiously outside of the boat and saw that a tiny black-and-white kitten was following Marco, straight to the boat. The sweetest cutest little thing that I’ve seen in a long while! 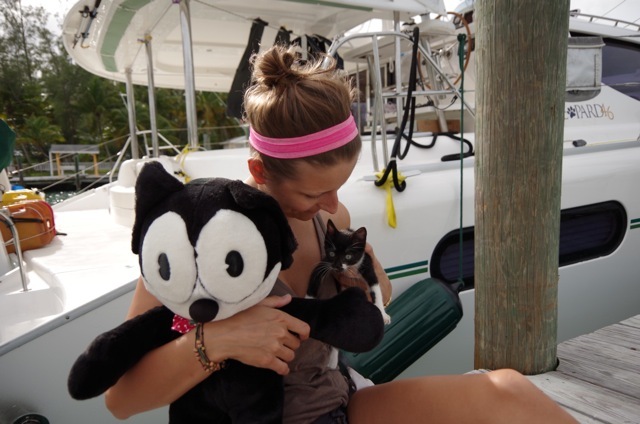 I fell in love immediately, jumped to the dock and said hi to our new little friend, who happened to be a little girl, as we later confirmed. She had been found in the marina office 3 days ago, and has probably lost her mom. After I had spent 15 hours smooching with Felix and had regained my strength, we tried to look for some groceries in the area. Our trip has extended itself long enough that we needed to re-supply, as our reserves were slowly being depleted. We left the area of the Marina with vague directions. “30 minutes or so you should be there”. Marco got on his skateboard, the Captn and I walked. A car went by, I put my thumb up, and 10 seconds later the three of us were cramped in with two ladies and two small children in a Corsa. The people here are super helpful and everyone stops to help / offer rides. The “Grocery Store” was unfortunately a only deposit for conserved goods, but we found a couple of useful things. That included being gifted (!) a bread that the lady in the store had baked herself, because all other bread had been sold! Incredibly nice, these island people! A gin tonic and a Barracuda Risotto later I write to you, after a cool day with everything someone can wish for. I am in love with this boat and we are simply an amazing team! The wind looks like it will tune down a bit tomorrow, and we’ll probably try to get the last step of the trip started. We’ll be 5 or 6 days at sea – an adventure! That’s it! We’re out! Peace!